Many were wondering what on earth we were doing and a few asked if I was crazy. 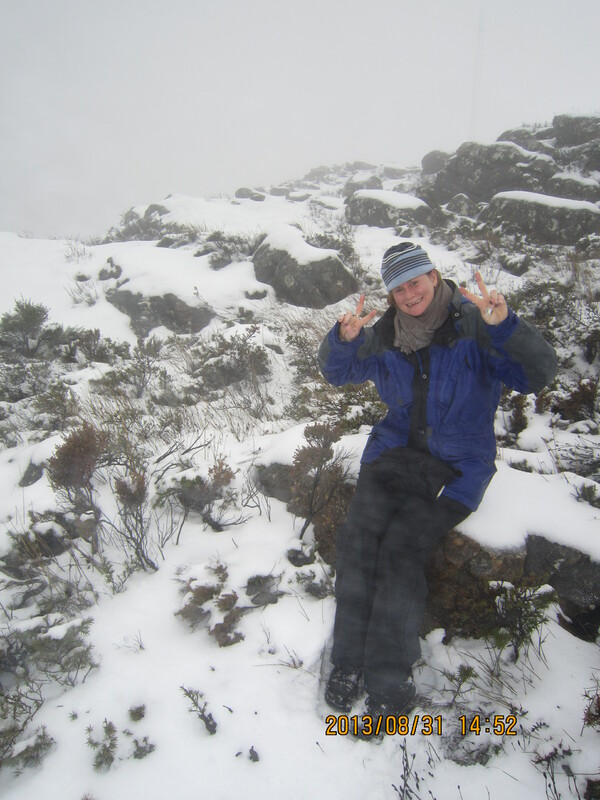 I recall vividly a post I wrote on crazy before my Kilimanjaro climb. 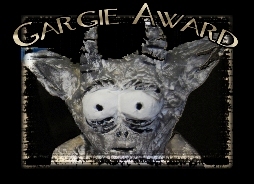 Yes, as things are hotting up for my next trip, things are beginning to feel like déjà vu! 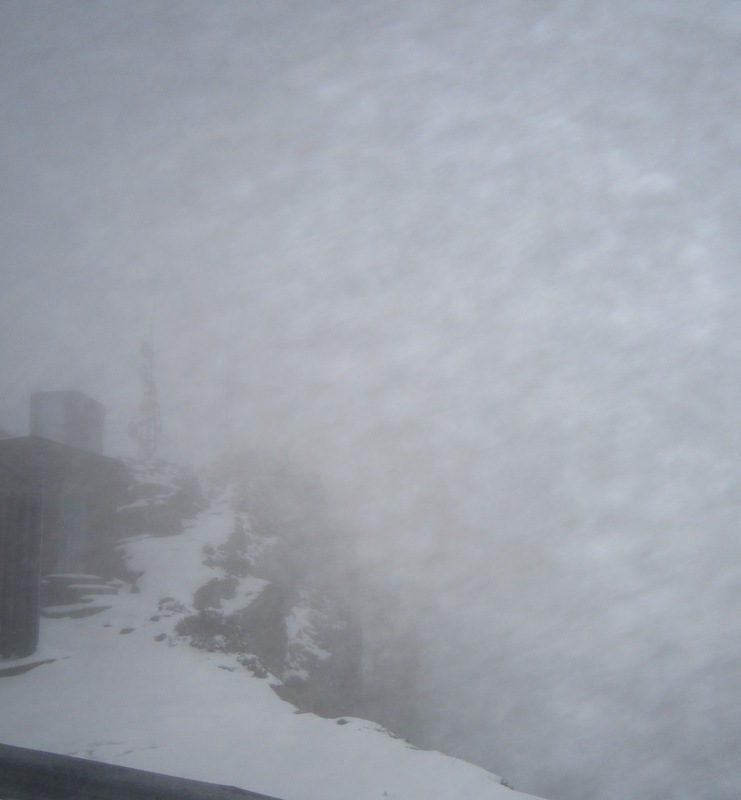 For the past week Cape Town has been experiencing stormy weather again and over the last 24 hours it had started snowing on all the mountains, even on top of our beloved Table Mountain! An early morning message from one of my team mates confirmed the Paarl mountains were covered in snow, something I got to see as I drove to work that morning and it was looking so pretty. For the next two days myself and my two Aggie team members were spending our time in the mountains. 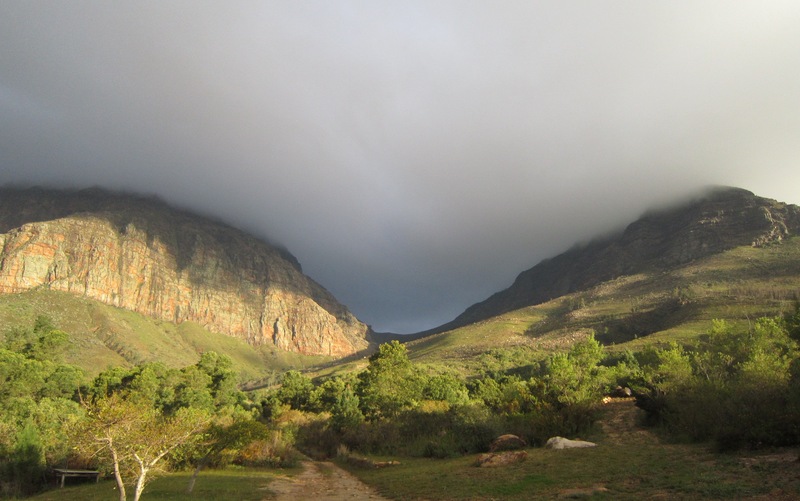 We would be based on a beautiful Olive farm in the Paarl mountains, which would be our base for some hiking in the mountains over the weekend. 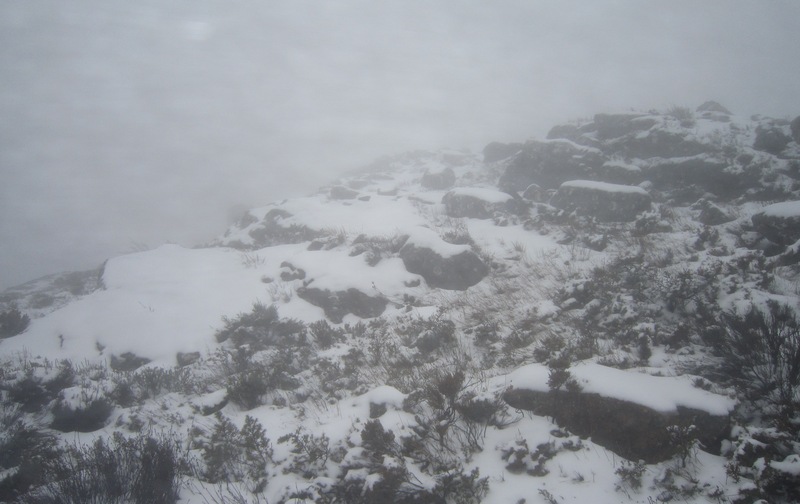 With the prospect of snow on the mountains, this weekend was turning out to be a perfect weekend for some cold and snowy weather training, something that we really don’t get to see and do in Cape Town very often, if at all. With a biting to the bone nip in the air on Friday evening the Alan, Simon and I headed out. We arrived in the dark and rain to the news that the farm roads had been washed away and we would have to leave our car on a neighbouring farm, transfer all our stuff and get a ride across in the 4 x 4 bakkie. We had only arrived and the adventure had just begun. As we pulled up to our camping site the rain began to fall again and a cold, icy wind blew off the snow-covered mountains that lay beyond the darkness. 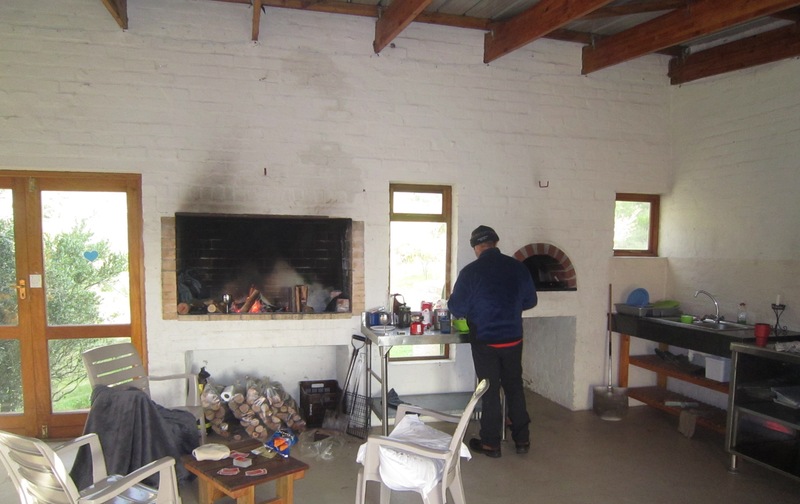 Avril, the farmer’s wife, offered us shelter in the recreational room which is a three walled area with the un-walled part of it covered in canvas sheeting, a pantry room on the side, a traditional pizza oven and a nice big fire-place next to it. Avril said we were the only hikers out in this extreme Cape weather and we had the place to ourselves if we wanted it. Call us crazy, but we still considered putting up the tent but with a nice fire already going and Avril’s persuasion we decided to set up “camp” inside the three walls! Avril bid us farewell for the night after arrangements were made for times to head up the mountains to the snow tomorrow morning. As we had arrived in the dark we could see nothing of the mountains and I for one was excited to get out there in the morning. We had a cozy Friday night sitting in front of the fire, after filling our bellies on delicious South African braai vleis (bbq meat). 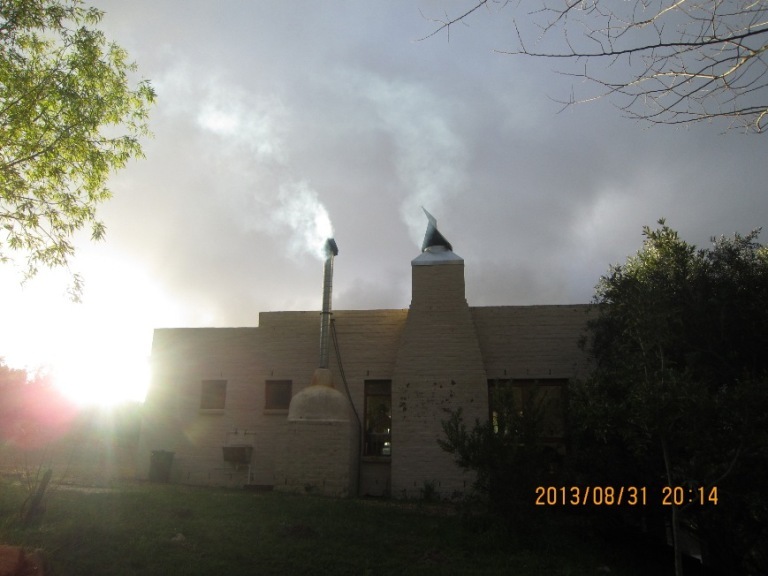 The noise from outside was almost deafening at times, the hard rain on the corrugated roof above us and the gushing of the Berg River outside, at times unable to tell the difference as to whether it was the rain or the river making the noise or a combination of both. It was as if the river and the rain were competing with each other to see who could be louder. We sat around chatting and then Alan pulled out a pile of card games. 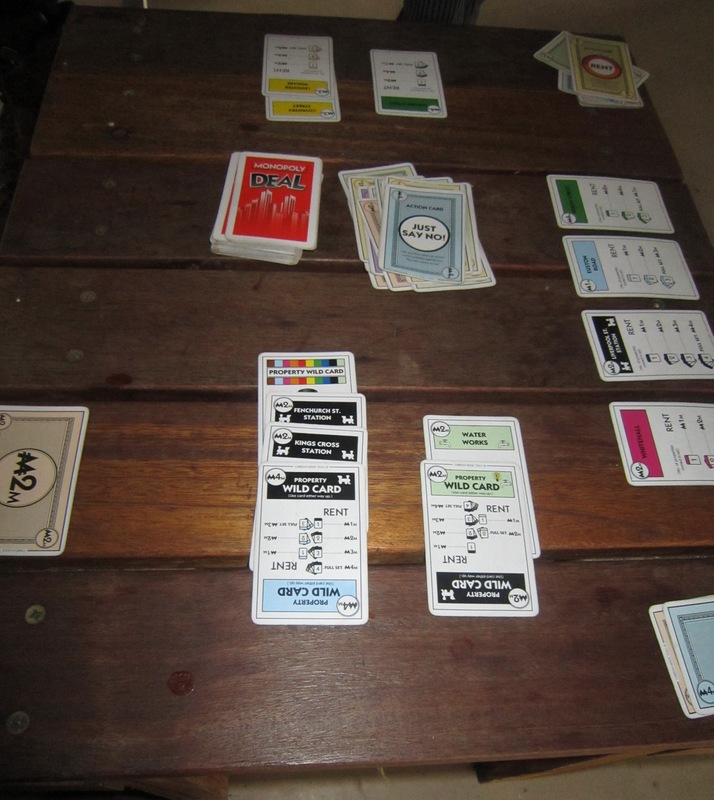 With a wide choice, we settled for Monopoly Deal Card Game. Little did we know as one began to shuffle the cards and deal our first hand that this would become our latest addiction! The most addictive game ever and the game that made time disappear! The game, to say the least, is addictive and over the weekend that was to follow, when we weren’t out in the snow hiking, we were playing Monopoly! One thing is for sure and we have all agreed on it, this game is going with us up onto the slopes of Aconcagua and who knows if we are energetic enough we may just get a game in on the summit itself! We played, we got creative, we bankrupted each other, we hit one person again and again, evils laughs, poker faces, eying your opponent and plenty of laughter. We kept adding logs to the roaring fire and I sat with an extra blanket I had brought along, wrapped around my legs for extra warmth. Occasionally, someone would yawn only to be forgotten at the next devious move someone was playing. Occasionally, we would all feel as if the temperature was dipping, none of us aware of why! 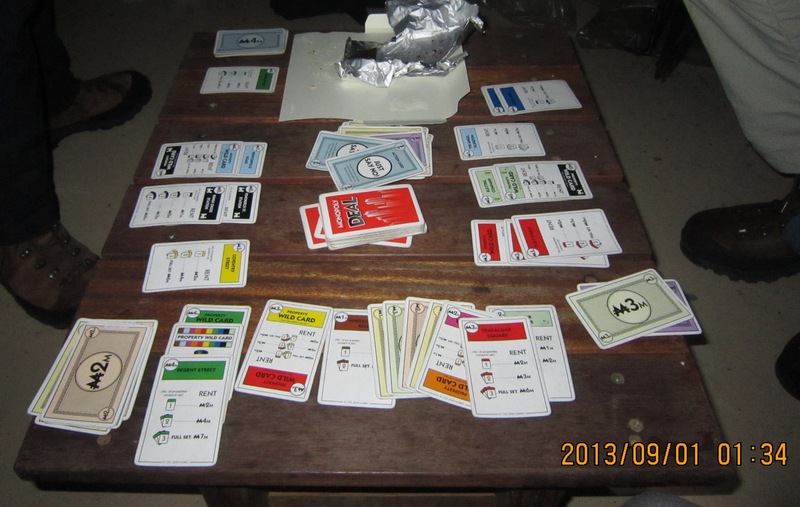 With the end of each game, more logs were thrown onto the fire, eventually red wine and whiskey turned to tea and coffee and we kept dealing another round. Eventually, Alan got up and it was while he was up he checked the time. Thinking it was around 11pm and that we could still get a few more games in before hitting our sleeping bags, Alan’s voice filled the air, “you guys are not going to believe what the time is!” All thinking it was still relatively early, we gasped when Alan announced it was 2:40am! Wow, this game was just that good if we were still going strong at that time but no wonder we had all started to feel the temperature dip, it was the middle of the bloody morning! True new diehard fans of this game, we decided we had to have just one more game before finally heading off to bed. It was a great last game full of conniving, underhanded, complete blindsiding fun! It was hard to put the cards down and go to bed but now somewhere over 3am and some snow hiking tomorrow it was best we got some sleep. 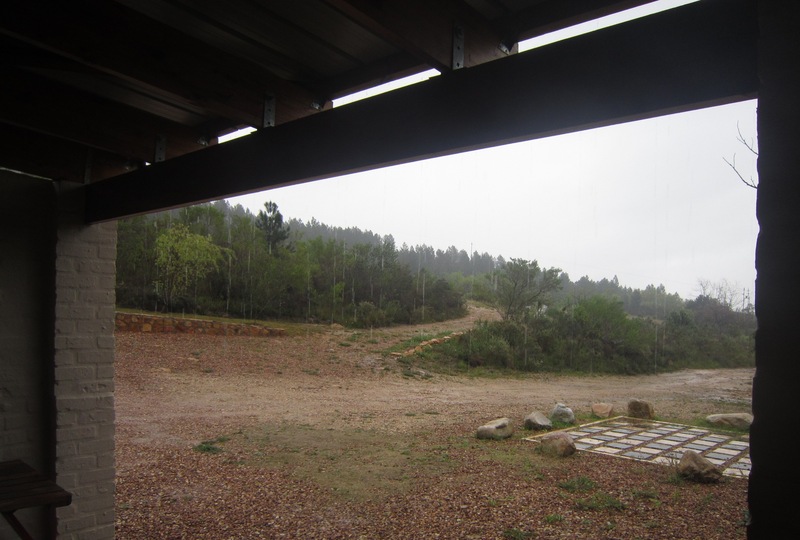 We awoke on Saturday morning to lots more rain and cold mountain air. A call from Bruce, the husband of Avril, to confirm they were going to take a drive to see what the snow was like and they’ll confirm it’s good to go out. We were due to head out about 10am. While we waited Alan cooked up a yummy breakfast of eggs and bacon and once again with full tummies, we sneaked in a few more games of Monopoly. 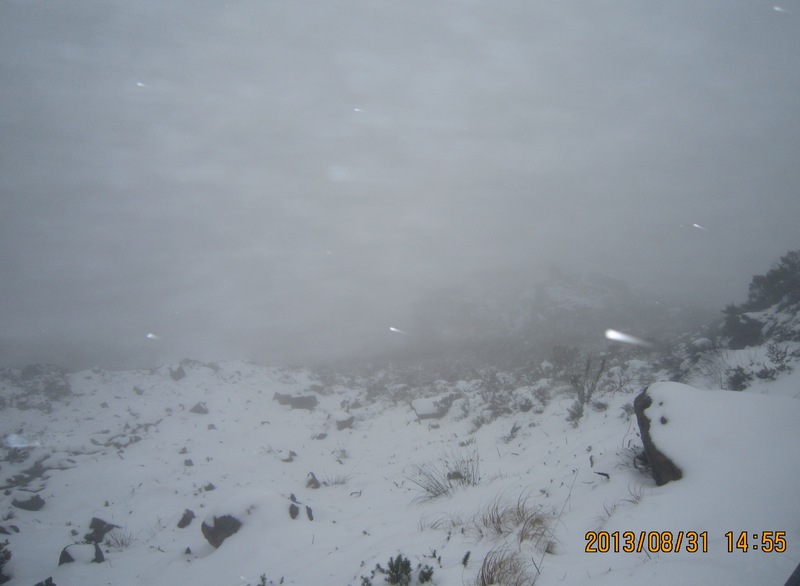 Finally the call came in, the snow was good, some sleet and wind, temperatures were cold but we were good to go! We awoke to a cold and wet Saturday morning. 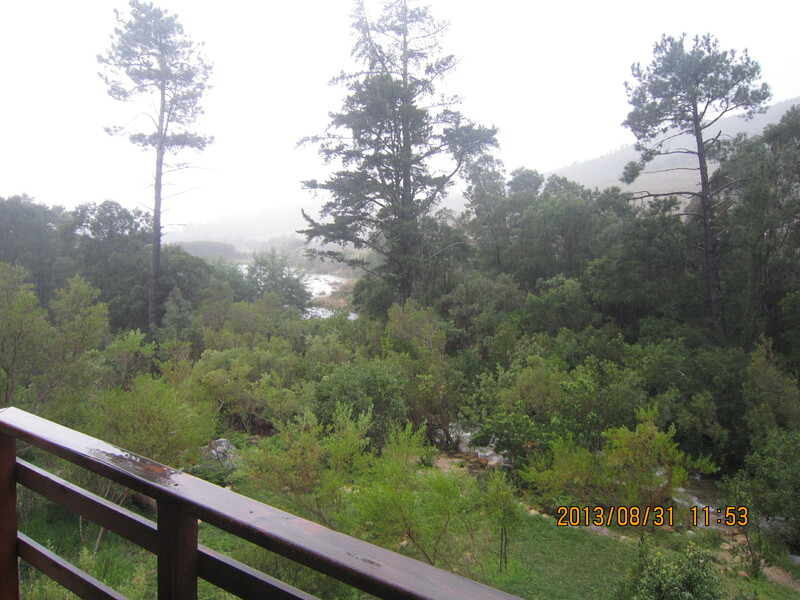 The view from the balcony overlooking the Berg River. Layers on, I felt warm and snug and I was ready to head out into the cold morning. We drove with Avril to one point, where she would wait for us with hot chocolate for us upon our return (this woman was truly amazing!) We switched over to Bruce’s 4×4 bakkie as the snow began to cover the ground and we hopped on the back. The wind was icy cold and I pulled my beanie down lower over my ears and pulled my hood on and zipped up my three outer layers of tops, blocking the wind. 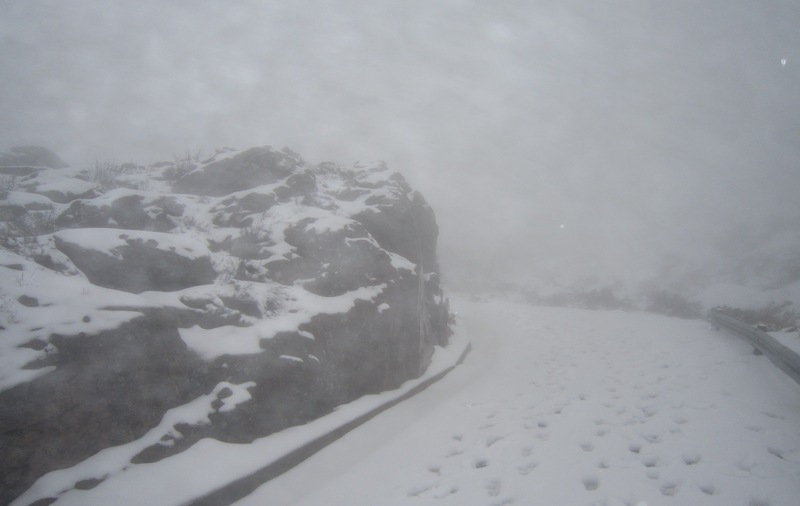 The snow was turning thick to a point that we could no longer drive higher. We pulled over and everyone jumped out. 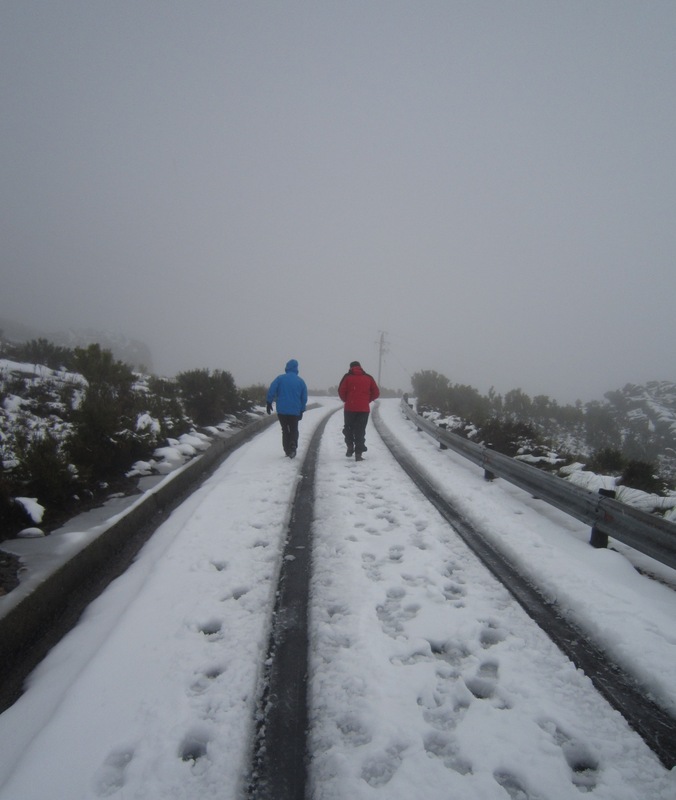 We walked along a winding road leading high up into the mountain, the first part the snow was thin and compacted from people walking on it, making it very icy. From the moment we had jumped off and started walking, the snow balls were flying around and for some reason I seemed to be a good target practice for the boys! Quite a few of us headed out but as we climbed higher and the snow grew thicker making it harder to walk, the people with us started dropping back and turning around again until it was just the four of us heading up. Soon we were walking on virgin snow, untouched by anyone. The crunch beneath my feet of fresh snow was music to my ears but as beautiful as this was, it made it so much harder to walk in. Leaving your own footprints as your feet sink deeper and deeper into the snow, with each step bringing fresher, untouched snow that just gobbled your feet up. As we rounded some corners the wind would begin to howl and the sleet would begin to fall again. Still I couldn’t stop smiling. I was loving every minute of this! Alan and Bruce up ahead, the snow was still thin and easy to walk on. 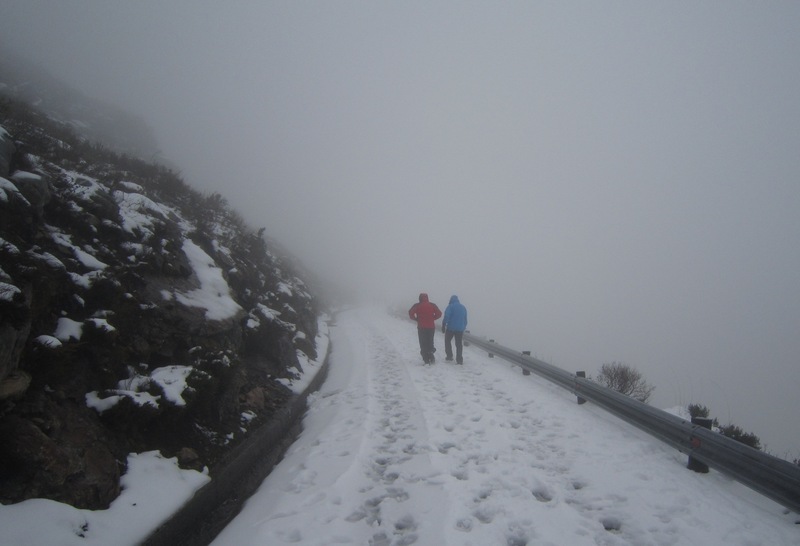 But that wasn’t too last long, as we walked higher the snow began to cover everything and it began to get deeper and harder to walk in. 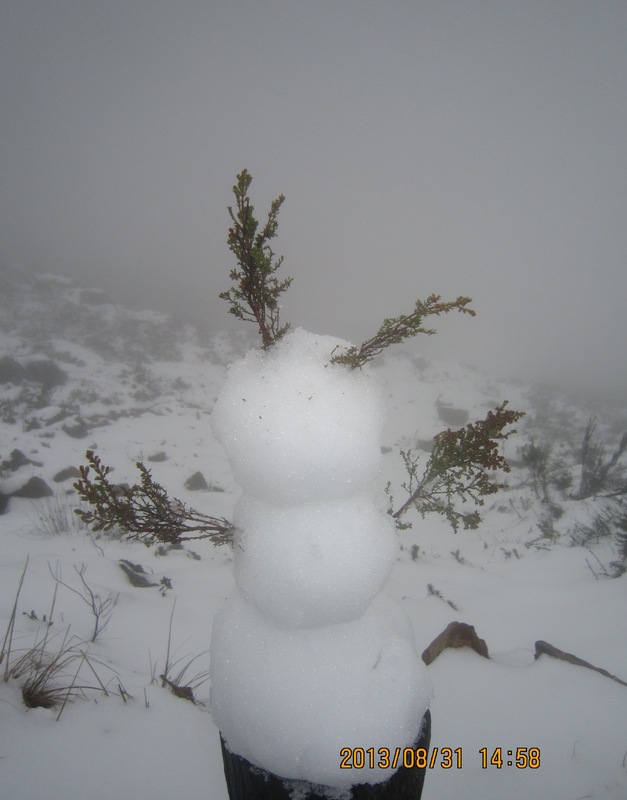 Someone before us had stopped to make this cute snowman! The climb up was a little tough for me and I was definitely feeling the lack of fitness that had crept back in over the month of August when I had fallen ill. This was my first bit of exercise since having fallen ill and it always amazes me how fit you can be but how quickly you can lose it again once you stop. As the sleet came down and the boys started pulling a little ahead of me staying a steady 15 paces up front, I reminded myself just one step at a time and I kept saying Aconcagua over and over again in my mind and with each step the smile on my face was still unmistakable! I did wish I had brought along my trekking poles, in my excitement to leave earlier that morning I had completely forgotten I had them and had left without them. This was turning out to be a really good first workout! Despite the dropping temperatures biting cold, as we climbed up I was overheating! Despite the falling sleet I removed my hood of my shell jacket and had to unzip my two top layers just to let some cooler air in. The feeling of having too much over my mouth and neck reminded me again of summit night on Kili. That feeling of claustrophobia and needing to get more air into my lungs. The minute I feel that cool air rush around me again, I found the energy again to keep pushing on. As the snow grew deeper I tried to walk in Alan and Bruce’s footsteps but even though I have long legs, the guys up ahead were both taking such large steps that were just too much for my long legs to reach. I was grateful when their footsteps were closer together allowing me to walk in their foot prints in the snow, giving my legs a tiny break from carving my own path in the fresh snow. There was thick mist all around us, not offering any views of the surrounding mountains, all we could see was the snow-covered path ahead of us before it disappeared in to the mist in front of us. No view to be seen, just white everywhere! Reaching the top, it was eerily beautiful, silent except for the wind. I was so tempted to fall down in the untouched snow and make a snow angel, however the outside of my clothes were already dripping wet and we still had to walk back down again and I wasn’t up to getting wet on the inside too as that would just make anyone plain miserable. 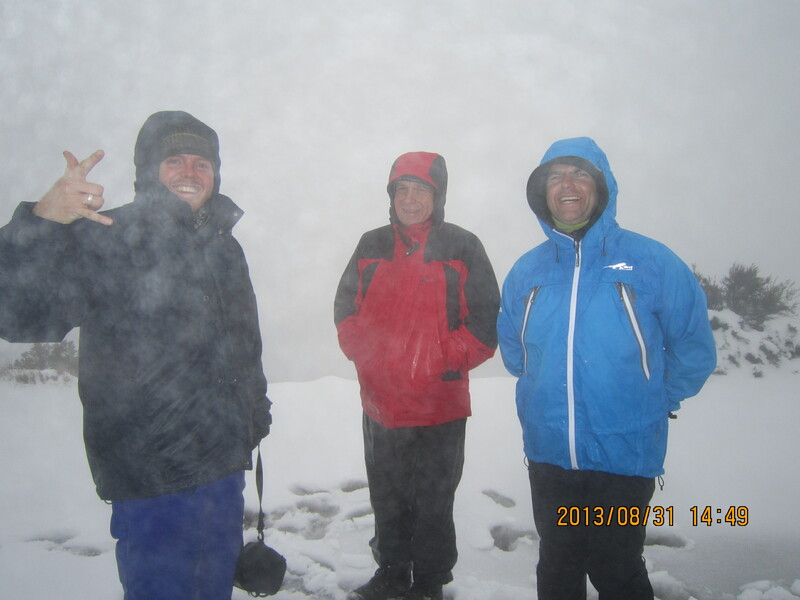 Simon, Bruce and Alan at the top! Very cold but all still smiles! 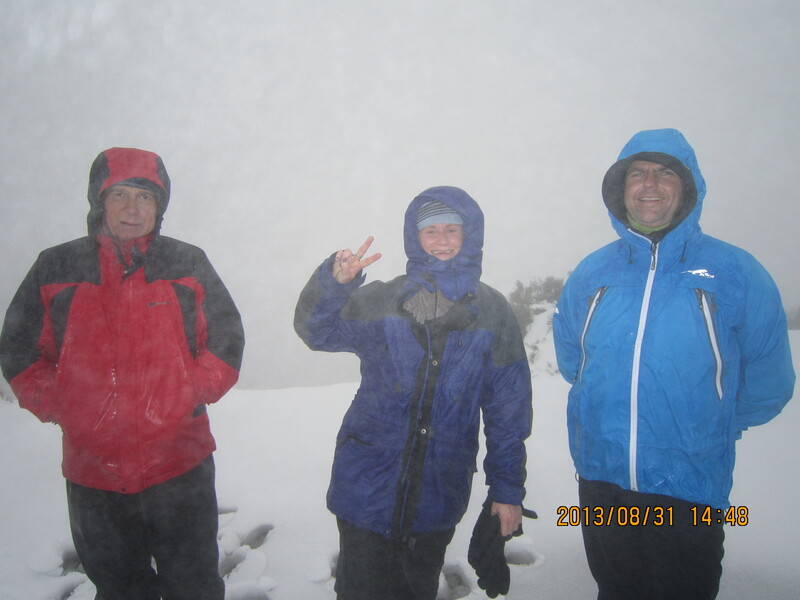 Bruce, me and Alan ~ I’m such a snow baby!! See all that beautiful untouched snow behind me, I so badly wanted to go and snow-angel it! At the top this is literally as good as our view got! We didn’t stay up at the top for too long as it was cold and with the low misty cloud cover we couldn’t see views of anything anyway! 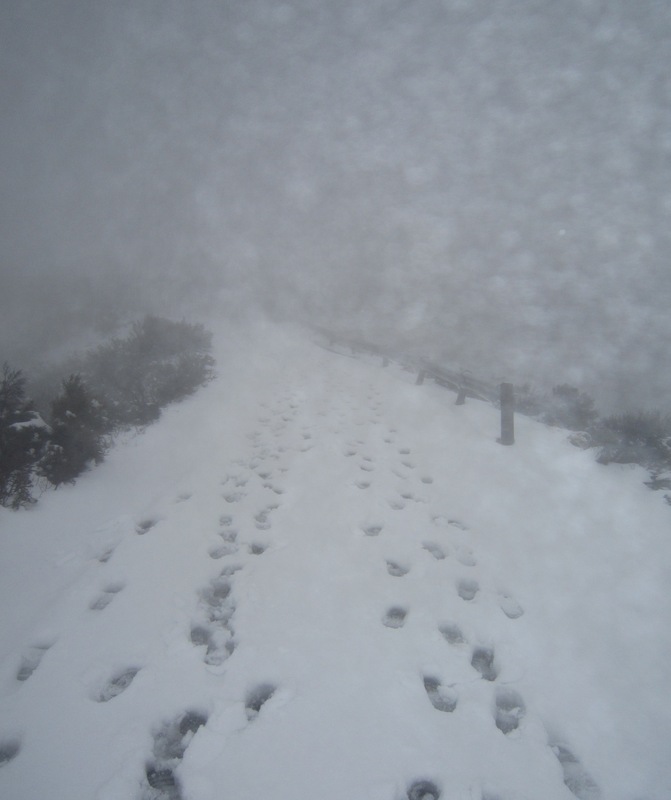 We started to make our way back down again, taking a few pics but careful to keep our camera’s dry. Simon stopped to make a small snowman too. Coming back down was the most fun as we could ski down instead of having to trudge through the snow and my tired legs were loving this! 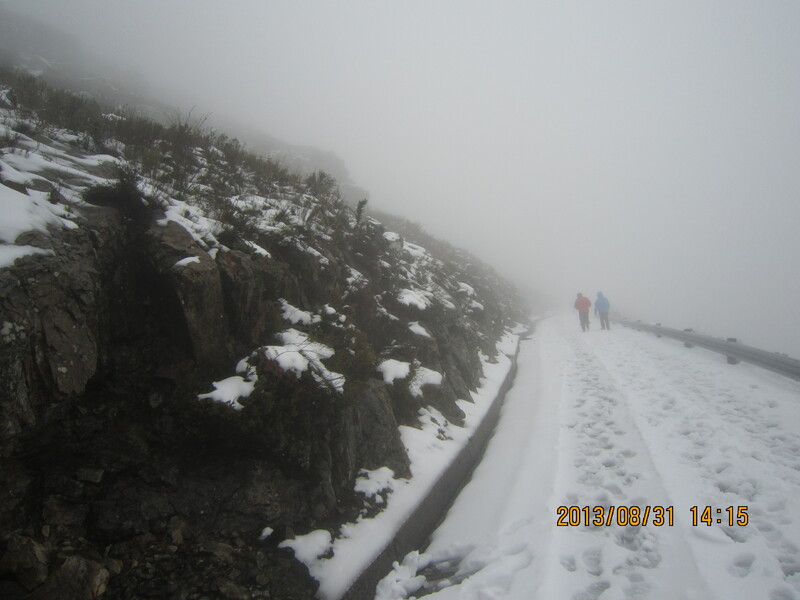 Again, it reminded me of how we skied down from the summit of Kili, except that was scree and this was snow. With each step I dreamed some more of Aconcagua and so too my smile just kept growing. Making our way down with the most beautiful winter-wonderland views. As we made our way down only our footprints were to be found in the snow. 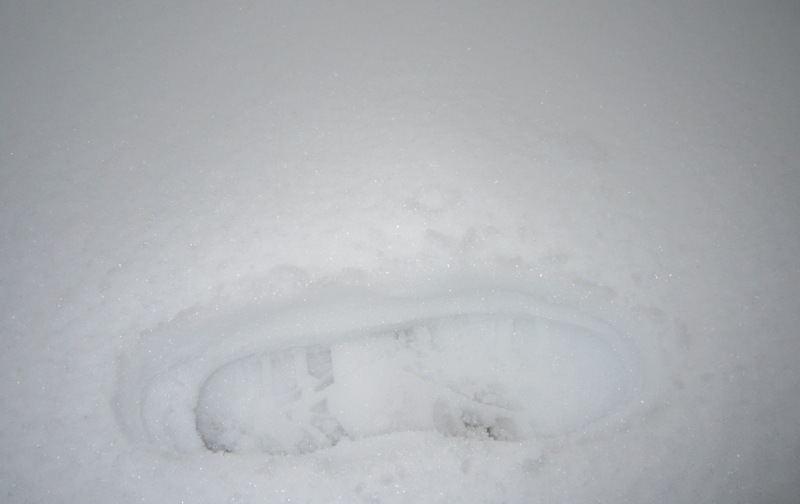 This was me trying to take a photo to show how deep our feet were sinking in the untouched snow. White on white is never a good comparison! Walking in a blizzard, naturally!!! Mountains and snow ~ what more could a girl ask for?! Not even cold and snow could get the smile off my face ~ in fact it was exactly that that put it there in the first place! 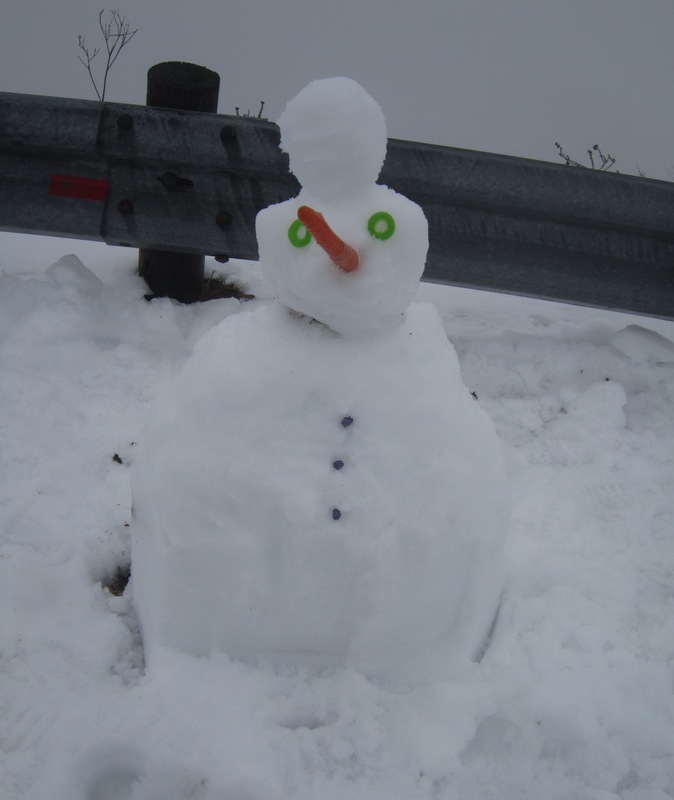 A quick faceless snowman built by Simon. Back at the cars, we took off our wet outer layers and hopped in the car where Avril had some nice hot chocolate waiting for us in a basket on the back seat. It tasted as good as it smelled and warmed us up from the inside out. Back at our “camp site” we hung out our clothes to dry, each of them dripping puddles on the floor. Socks and gloves lined the fire-place in hope they would get dry. We once again got comfy for the rest of the afternoon in front of the fire, playing Monopoly of course! It was definitely time for a few rematches and some payback too! Later Alan began to make our pizza dough and Simon and I got the pizza toppings ready. When done the last of the sun rays were finally breaking through clouds and I took a nice wander around outside before night fell. Alan busy with our pizza dough and our little table in front of the fire-place with our Monopoly game on it. Aah yes, a home away from home. The no walls part of where we camped for the weekend. 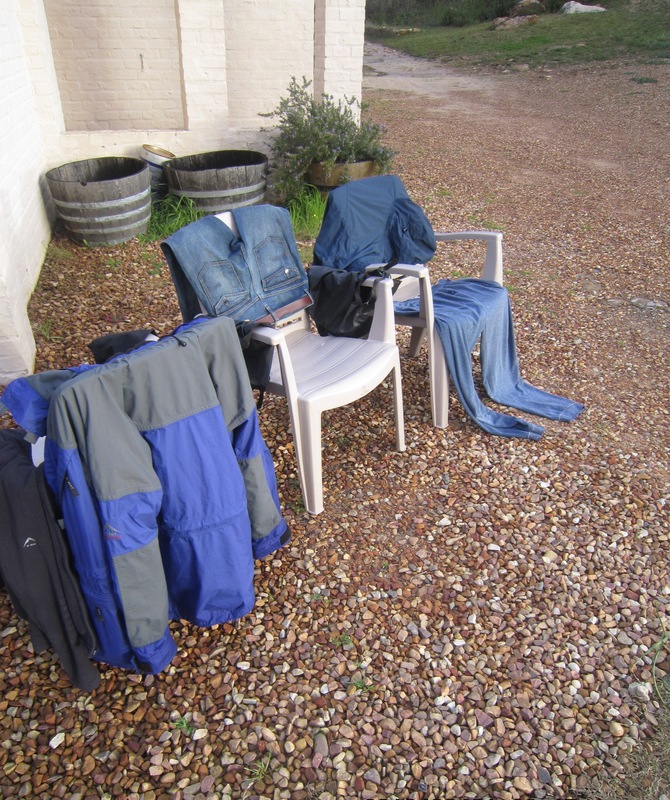 In the late afternoon a tiny patch of sun came out and we moved all our clothes outside in hope the wind and sunshine might just dry them out a little bit before tomorrow’s hike. Glorious sunshine outside and even a bit of a view of some of the mountains around us. 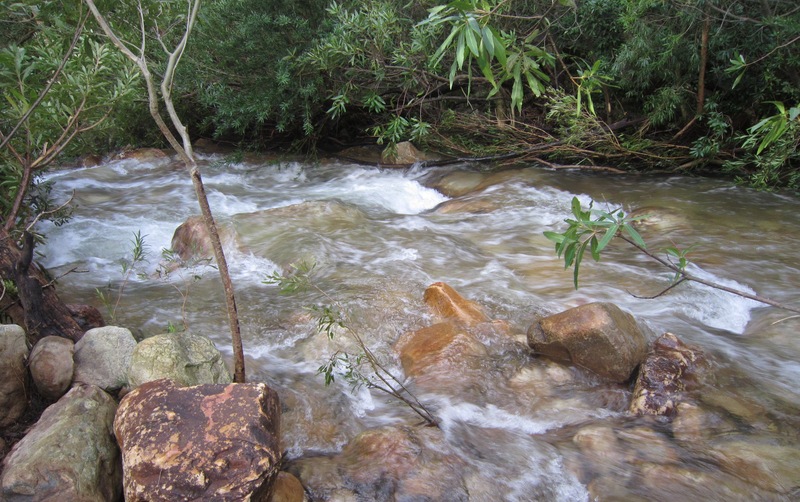 The Berg River that was rumbling very loudly past where we were staying. The camping spot where we were going to pitch our tent was right next to this river. 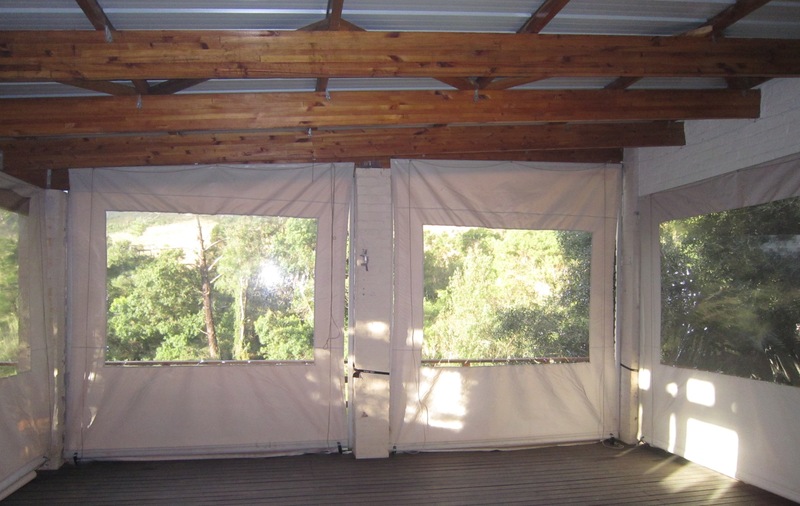 The front section of the communal room where we were staying looking over the river and aptly name The River House. Captured this as I walked back to our “camp” site, the smoke from the pizza oven and the smoke from the roaring fire inside. That night the three of us dined on the most delicious homemade pizza’s and Avril and Bruce joined us too but they would be braai’ing. 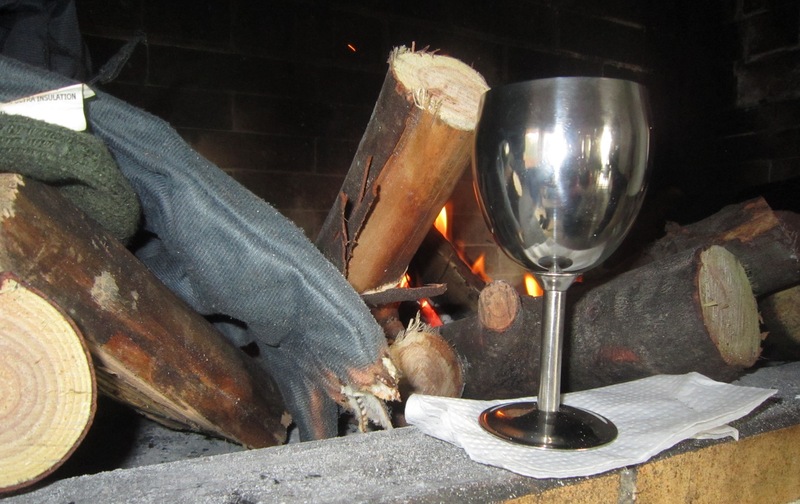 We drank wine, burnt some gloves and sat around chatting in front of the roaring fire. Yes, would you believe as much as Simon loves his fingers he decided he no longer needed finger tips on his gloves and so proceeded to burn them right off! Simon’s new look gloves ~ who needs the fingertips anyway! 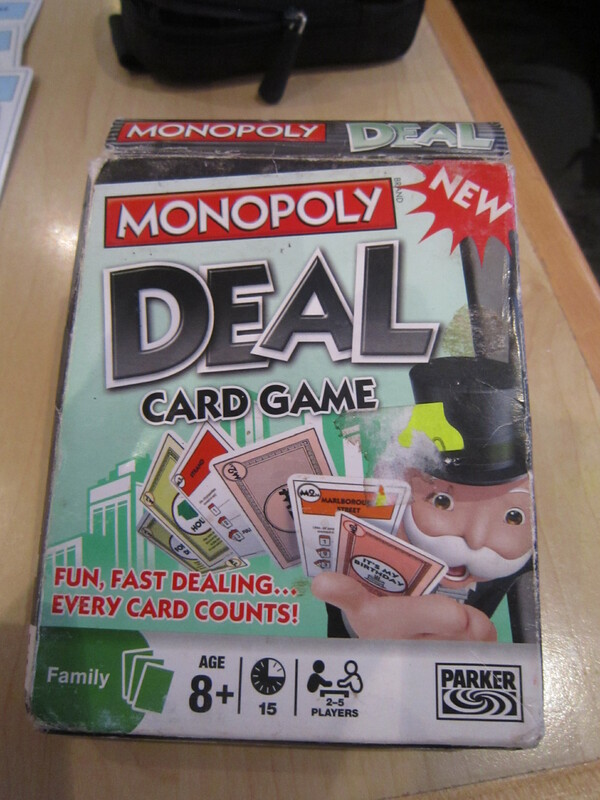 After hours of chatting, no sooner than Bruce and Avril departed, the Monopoly cards came out and even thought it was already late, the three of us just had to get in some more rounds of our game. That game is seriously addictive! We headed off to bed somewhere half way between midnight and 1am. Snug in a nice warm sleeping bag with the fire cracking on the side, I drifted off to sleep quickly, once again excited for what lay ahead tomorrow….